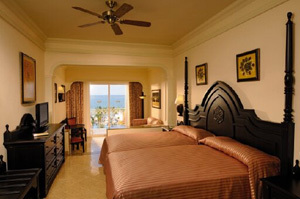 Riu Palace Pacifico is an all-inclusive, family-friendly hotel in the beautiful, old-world village of Riviera Nayarit. Magnificent architecture and elegant furnishings combine with unparalleled service to offer guests a relaxing haven of vacation indulgence. Guests of all ages will enjoy top-notch facilities, including a spa and fitness center, special activities for adults and children, a variety of excellent dining venues and 24-hour food and beverage service. The ideal place for vacationers seeking total relaxation and a good bit of pampering in picturesque Riviera Nayarit. Riu Palace Pacifico is located on beautiful Flamingos Beach, only 2 minutes’ drive from sister hotels, Riu Vallarta and Riu Jalisco, and just 9 miles away from downtown Puerto Vallarta. RIU Resorts' third hotel in the beautiful charming Riviera Nayarit, Riu Palace Pacifico, features 445 Junior suites and Jacuzzi suites. With activities to keep the whole family entertained — including an introductory scuba lesson, daily planned activities and nightly entertainment — Riu Palace Pacifico is the ideal place for your sunny Mexico vacation! The resort also features exchange privileges. Guests can enjoy access to all facilities, activities and entertainment at Riu Jalisco and Riu Vallarta. Please Note: dinner restaurants excluded. 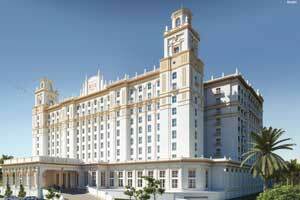 All RIU Palace Hotels will offer complimentary Wi-Fi in the lobby and in all guest rooms.